Situated in Saint-Cyprien-sur-Dourdou, this hotel is 8 km from Conques and just 3 km from the Causses du Quercy Regional Park. Free Wi-Fi access is available in each room. All of the guest rooms at Auberge Aux Portes de Conques look out on the village square. Each carpeted room has its own bathroom. A buffet breakfast is available every morning. Traditional dishes are served in the restaurant which has al fresco dining on the shaded terrace. 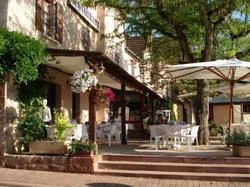 Auberge Aux Portes de Conques has 2 mountain bikes for guests' use and also lends tennis rackets. The town's tennis court and swimming pool are just 100 metres away. Rodez is 31 km from the hotel and free public parking is available on site. Free Wi-Fi access is provided in this en suite room.